Six cereals surveyed had even more sugar than in 2013. Cereal manufacturers aren’t getting the message their kids’ products are too high in sugar. A Consumer NZ report has found sugar levels have changed little since it last looked at these products in 2013. Six cereals had even more than they used to, with one packing a 30 percent increase. Consumer NZ looked at 50 breakfast cereals that appeal to kids using bright packaging, cartoon characters, games or sweet flavours, as well as some healthy options commonly eaten by children. The report compared sugar and sodium content in the cereals with that found in previous surveys. While companies have reduced sodium levels, it’s a different story when it comes to sugar. Ms Chetwin said although the average sugar content of kids’ cereals had gone down from 21 percent this year versus 27 percent in 2013, it was disappointing six products had more sugar than previous surveys. 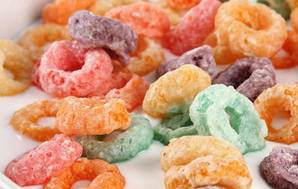 Kellogg’s Coco Pops Chex and Crispix Honey had 20 percent more and Home Brand Fruity Rings a whopping 30 percent more. These cereals all have more than two teaspoons of sugar in a 30g serving. “Manufacturers need to do more to reduce the sugar load in their products,” Ms Chetwin said. The news was better for sodium, the “baddie” in salt. Nineteen cereals had 20 percent less sodium than previous surveys and five products had reduced their sodium content by more than a third. So what should you be pouring in your kids’ breakfast bowl? Consumer NZ’s survey found wheat biscuits or porridge are a better option for everyday eating. They are low in sugar and have moderate amounts of sodium. But watch out for sweetened varieties of porridge – they can be high in sugar. You can read Consumer NZ’s kids’ cereals report online or in the June issue of Consumer magazine. Cereal manufacturers aren’t getting the message their products are too high in sugar. Our latest survey of 50 cereals has found companies have cut the sodium but it’s a different story when it comes to sugar.